This is the last in a five part series entitled Leadership In Pictures. When one reads current leadership articles it often feels like Diogenes roaming the earth searching for the truthful man (or woman). Writers bemoan the fact that they cannot find one person who consistently exhibits sound leadership principles techniques and who applies them with wisdom and grace. To paraphrase the words of Peter, Paul and Mary, “Where have all the leaders gone”. There is a problem. Leadership is in disrepute. Articles regularly enumerate the myriad failures of leaders. By almost any measure (trust, performance, talent development, etc. ), today’s leaders do not live up to their lofty calling. One would have to believe that leadership ranks are filled with either self-serving egotists or incompetent buffoons. How did all these incompetents get promoted into leadership positions? 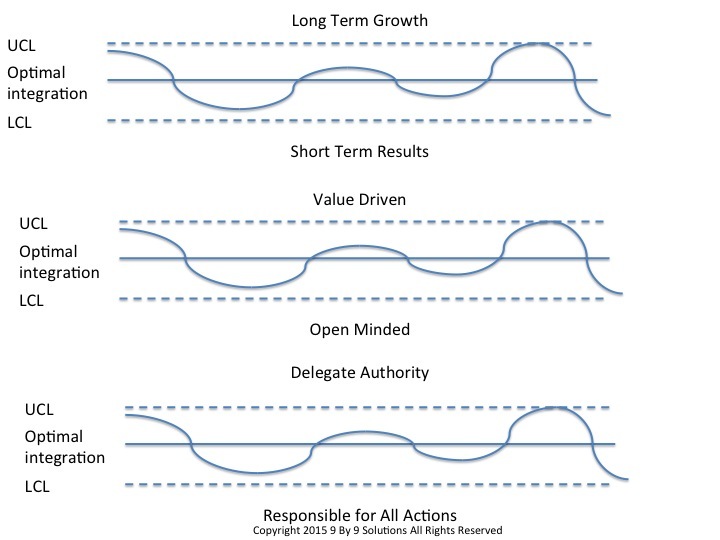 (It is interesting that many desire those coveted positions and believe that they (and only they) could demonstrate how great leadership should be properly performed). The truth is many of the articles on bad leadership are accurate. Every leader makes mistakes, sometimes really bad ones. But the articles are based on a false assumption. They assume that great leaders are perfect leaders. Bottom line: There are no perfect leaders! Every leader without exception takes actions that can be labeled as “bad” or even incompetent. No leader is so consistently great that every decision and behavior is always aligned with the textbook answers. (And who knows what the standard is: WWSSD? What Would Simon Sinek Do?). 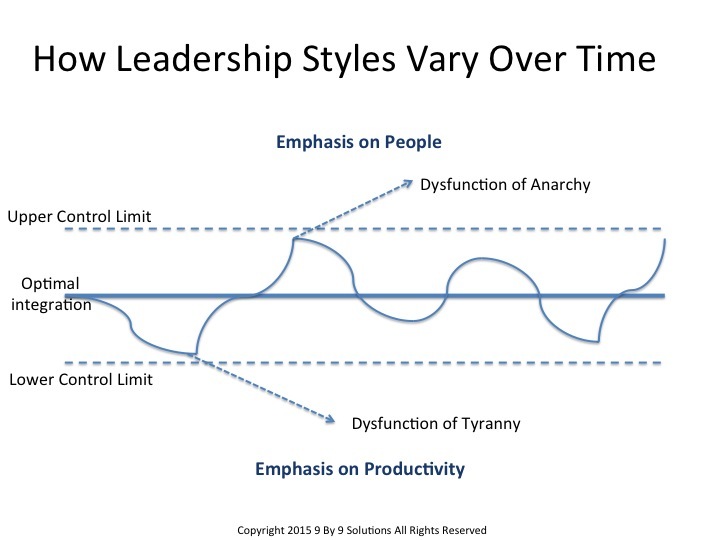 The reality is that leadership styles and behaviors vacillate over time. Leaders are human. They get tired and they make mistakes. They do not always read situations correctly or even think through every leadership action. They sometime face pressures no one else understands. Bottom line? No leader is perfect and no leader is totally consistent. Every leader is concerned with productivity and results. No organization can survive without quality products or services. Simultaneously, leaders are concerned with people. No organization can succeed without talented, engaged people. But people have needs. Employees want and require direction, engagement, communication, and recognition. Consider the following diagram. These two, usually contradictory, responsibilities of the leader beg for leadership time and attention. While the optimal solution is to integrate both dimensions into every leadership action, leaders are not always able to do this. 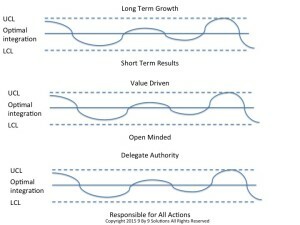 Over time leaders’ behaviors (their leadership styles) swing from one responsibility to the other. (Sometimes leaders do things knowing in their heart it is not the best thing to do.) 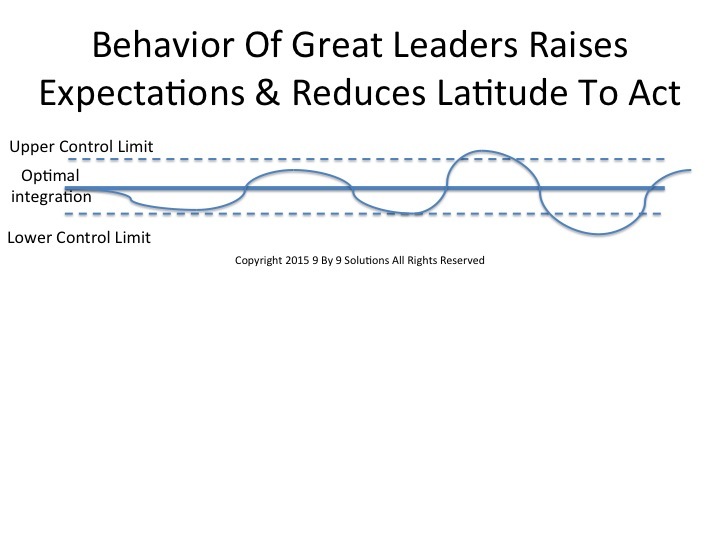 If behavior goes too far in one direction, the leader bypasses an acceptable “control limit” and their behavior becomes “pathological”. Because styles vacillate, if one observes a leader’s specific behavior at a given point in time, any leader can be labeled as either too production or people oriented. Perhaps that behavior could even be labeled as pathological. As a result, people walk away convinced this is a bad leader after viewing one action or behavior. 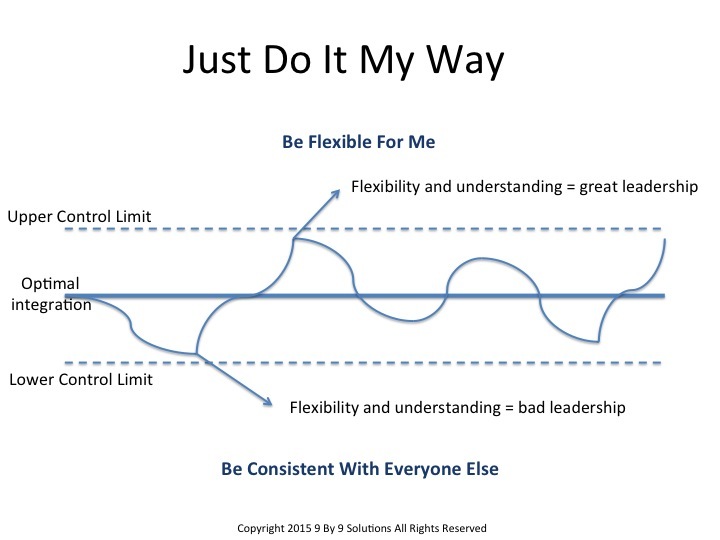 (Obviously there are a few leaders who always operate outside the acceptable control limits. That is a discussion for another day). Leaders must juggle these multiple responsibilities. As they do, the opportunities to criticize a leader’s behavior increase exponentially. Leadership is often evaluated from a personal and individual lens. Employees view the “greatness” of a leader by assessing how willing they are to be flexible with that employee’s personal needs. The labeling of great and not-so-great leadership rests in the eye of the beholder. Individuals see leaders as great based on the leader’s understanding and flexibility around the employee’s personal needs and situations. But those same employees expect leaders to be unbendingly consistent with others’ situations and request for exceptions. •	Flexibility with others? Bad leader! •	Flexibility with me? Great leader! 1	Leadership cannot be fairly evaluated in the short term. Except for decisions concerning illegal, immoral, unethical or unsafe activities, leadership greatness is not achieved in one moment of time. (Note: heroes are revealed in a single moment but not leaders). 2	True leadership greatness is demonstrated in the “and” (the integration), not the “either’-or”. 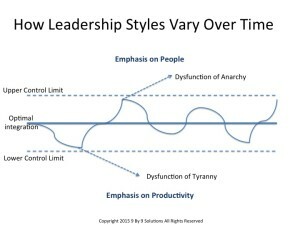 The more a leader vacillates between extremes rather than integrating the two dimensions, the higher likelihood the leader will be viewed as “bad or incompetent”. 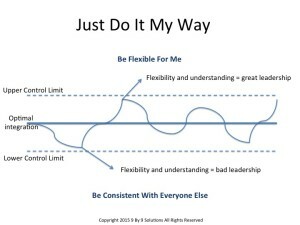 3	The better a leader integrates two polar opposite responsibilities, the more narrow the upper and lower control limits become. 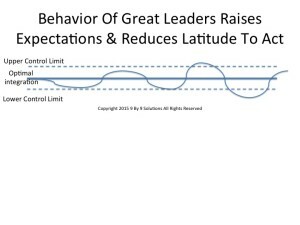 Therefore, better leadership creates higher employee expectations resulting in less flexibility for the leader to vacillate before crossing into “bad” leadership practices. Therefore it is easier to become disappointed with a great leader (who’s actions stray outside the narrower control limits) than an incompetent one. Leadership is the one position that can be faulted in every situation. A leader will be criticized for what they did or did not do. They will also be criticized for doing the right thing but doing it in the wrong way. Many times leaders feel they cannot win. The truth is no leader will ever be universally acclaimed; there will be always be those that are critical of any leader’s actions. Leadership has never been easy and it is getting tougher. Read all the posts on LinkedIn. Study and practice for a week or two all the “how-to’s” and techniques that “thought leaders” and “Influencers” write about leadership greatness. Advice abounds but none of that advice will make a person a great leader. Remember this. Leaders are developed in a pressure cooker over a long period of time and achieving greatness requires the greatest of all teachers: trial and error. That means really good leaders will make mistakes. So if you want to find an action of a leader to criticize, have at it. The opportunities will be many. But if you are looking to evaluate a leader’s greatness, you will need to wait a few years to make an accurate assessment. 9 by 9 Solutions assists organizations in producing significant results while developing young leaders through an innovative combination of mentoring, coaching and project activity. Contact us to learn how to develop the next generation of leaders while simultaneously improving your organization. “That’s On Me” Why Is Accountability Just For the Little People?